What did I do prior to noticing the pain? Did I have any change in my workout routine? Did I have an increase in activity or add a new activity? Is there a specific movement where pain was felt directly after? What is the length of the pain? Is this pain limiting my activity? 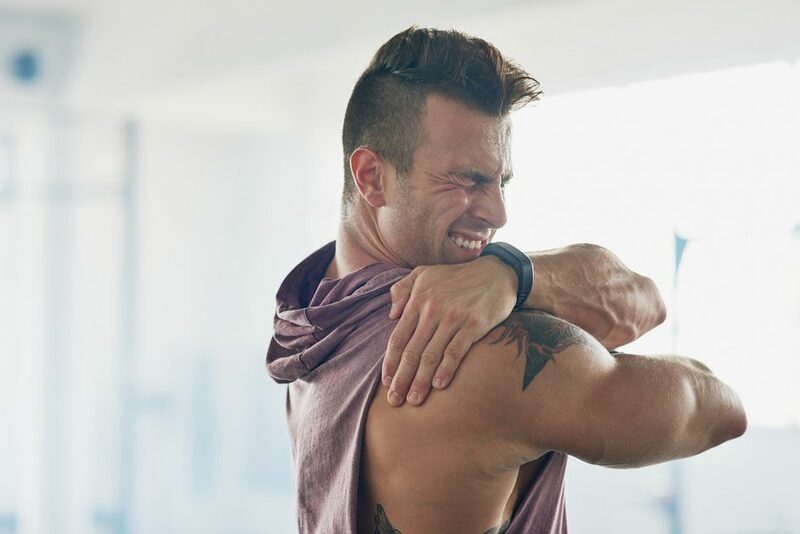 Delayed Onset Muscle Soreness (DOMS) is stiffness and discomfort felt in the muscles that will develop within 24-72 hours after a rigorous workout or change in physical routine. DOMS is caused from many micro traumas to the muscle fibers after repetitive lengthening of the muscle while under load. There will be no pain while at rest and stretching the muscles will recreate the pain. Symptoms will be delayed while getting progressively worse throughout the day. Muscles will feel tender to the touch, tight and achy. Sitting for prolonged periods of time will worsen these symptoms, although movement that increases blood flow to the area will help improve symptoms overall. DOMS is a natural occurrence after a tough workout—a “good” hurt. Acute strains or injuries, on the other hand, are much more serious than typical muscle soreness. Injury results from damage to muscle or tendons from a sudden lengthening to the tissue. Pain will be felt either during activity or immediately after and will be sharp and located. The damage to the tissue will be worse than DOMS and may have some bruising and pain at rest. Any use of the injured muscles will exacerbate the symptoms and will worsen with continued activity. Recovery time will typically take 4-6 weeks of rest and therapy of that specific area. One of the biggest components that answers the question, “Am I injured or just sore” is that unlike DOMS, the pain from an acute injury does not resolve after a few days. If your pain continues after 72 hours, you should consult a medical professional to evaluate the injury and get on the correct recovery plan. So ask yourself if you feel sore or injured. Soreness is a sensation of pain that does not limit activity (DOMS). Injured is any kind of harm such as a tear or severe sprain that limits or immobilizes the extremity (acute injury). If you have answered all the above questions and still can’t pinpoint what is causing your pain, contact your doctor to get you on the right track to recovery. Contact any of our 5280 Cryo and Recovery Clinics today to help alleviate your pain. Our experienced doctors and staff have many recovery options at hand to get you back to full force. Whole body cryotherapy, A.R.T, NormaTec, and Compex are a few of many modalities we provide. Call and schedule today to get your recovery plan started!